To view this newsletter on the web, click here. President Trump’s FY2018 budget proposal and the Congressional Budget Office (CBO) score of the American Health Care Act (AHCA) that passed the House were both released this week. Of particular concern is the fact that the Trump budget and AHCA would cut Medicaid by up to $1.3 trillion over ten years! The Trump budget proposal assumes the AHCA Medicaid reductions (approximately $839 billion) and adds additional cuts to be achieved by reducing the rate of the federal share within the changed structure of Medicaid to either a per capita cap or block grant. Details include the following. The Congressional Budget Office scored the American Health Care Act. The CBO score released yesterday found that the bill would cut over $830 billion in Medicaid, including a drop in the number of Medicaid beneficiaries by 14 million over ten years, and would open the door to repealing major health care protections like coverage for people with pre-existing conditions. The CBO estimates that 23 million Americans would lose health insurance coverage. A letter calling for the rejection of these cuts was sent to the NYS Congressional Delegation by more than thirty associations and organizations including CP of NYS & COPA. The letter can be found here. President Trump’s FY2018 budget proposal includes additional draconian cuts. The budget calls for increased defense and national security spending ($639 billion over ten years), while making deep cuts to Medicaid, the Supplemental Nutrition Assistance Program (SNAP), and Social Security’s disability programs. It also provides a framework regarding health care reform, regulatory reform, and government oversight and accountability. The budget assumes some savings will be realized through robust economic growth, predicted by the White House to rise to around 3 percent (a full percent higher than projections by the Congressional Budget Office and private sector economists). Medicaid: The budget would cut Medicaid by up to $1.3 trillion over ten years, by building on the reductions present in the American Health Care Act (AHCA) (approximately $839 billion) and adding additional cuts to be achieved by reducing the rate of the federal share within the changed structure of Medicaid to either a per capita cap or block grant. These Medicaid cuts will include disproportionately deep cuts to HCBS, Education services and all of the Medicaid programs that serve people with developmental disabilities and seniors. The New York State Association of School Business Officials estimates that these Medicaid cuts would result in a loss of $125 million to schools around New York State and services for students with disabilities would be most affected by the changes. Social Security: The budget would include significant cuts to Social Security programs totaling approximately $74 billion over ten years. Of that total, $50 billion would come from a demonstration program run jointly with the Department of Labor which seeks to help disability beneficiaries to return to or stay in the workforce, obviating the need for SSI or SSDI benefits. It also makes changes to the timeframe for retroactive benefits to be paid, the method for recovering overpayments, and imposes a sliding scale on SSI beneficiaries. CHIP: The Children’s Health Insurance Program (CHIP) would be extended for two years, through 2019. However, the budget would eliminate the 23 percent enhanced FMAP and maintenance of effort requirements, resulting in a $4.6 billion cut over two years. The total reductions to CHIP spending would be $16.7 billion over ten years. SNAP: Funding for Supplemental Nutritional Assistance Program (SNAP) would be reduced by approximately $200 billion over ten years. The budget would “rebalance” the State-Federal partnership for SNAP benefits, requiring a 10 percent match from states beginning in 2020 and increasing to 25 percent by 2023. The budget also includes reforms to “tighten eligibility and encourage work,” including limiting the Earned Income Tax Credit (EITC) and the Child Tax Credit (CTC) to those who have social security numbers valid to work in the United States. Housing: The budget would cut Department of Housing and Urban Development (HUD) by approximately $6.2 billion over ten years. It would cut funding to the Housing Trust Fund, saving $1.12 billion over ten years. However, the budget does retain current funding levels for certain fair housing initiatives. Office of Disability Employment Policy (ODEP): The budget would reduce funding for ODEP by $10.9 million in 2018. ODEP would join in the demonstration project jointly funded by the Social Security Administration aimed at returning recently ill, injured, or disabled employees to work. The budget directs ODEP to eliminate “less critical” technical assistance grants, but does not go into detail on which grants will be eliminated. Because of all of these devastating cuts, it is important that everyone take action! Cuts to Medicaid will impact ALL New Yorkers but they will be devastating to New Yorkers with disabilities and seniors! Stop the AHCA and President’s proposed cuts! Everyone should be active on Twitter and Facebook. It is important to tag the @bFair2DirectCare page on Twitter and Facebook to pick up all the followers that were active and brought together by our #bfair2DirectCare campaign. Other ideas for hashtags: #BecauseofMedicaid #TrumpBudget #AHCA #TRUMPCARE #CBOSCORE #preexistingconditions #Medicaid #MedicaidMatters. Additionally, tag your representatives in Congress (https://twitter.com/cspan/lists/members-of-congress/members?lang=en). Consider tagging members of the media as well as state legislators. Consider reaching out to members of the media to let them know how devastating these cuts will be to the people we support. Issue a press release, post it and tweet it. Ask your staff and family members to post and tweet as well. CP of NYS strongly opposes S.4736-A (Lanza)/A.6830 (Weprin) which would require that all allegations of reportable incidents be called into not only the Justice Center’s Vulnerable Persons Central Registry (VPCR), but also the 911 operator and the county district attorney. The failure to call the VPCR, 911 and the county district attorney for every reportable incident, no matter how minor, would result in a class E felony. CP of NYS joins the sponsors in the desire to enhance protections for all vulnerable New Yorkers. Unfortunately, this bill will have the opposite effect and will wreak havoc on caregivers, 911 operators, law enforcement, district attorneys, all first responders, and vulnerable individuals. Current regulations already require that agencies and staff call and report all incidents, medical emergencies, possible abuse, neglect, crimes, deaths, etc., to the Justice Center’s VPCR and, if appropriate, 911 and/or local law enforcement. Call your Senator and Assemblymember. (To find your local legislators, go to the New York Families for Disability Rights (NYFDR) website here. Please OPPOSE S.4736-A (Lanza)/A.6830 (Weprin) as it would be devastating to all vulnerable people who the Justice Center is designed to protect. Please DO NOT co-sponsor this bill, and if you are a co-sponsor, please remove your name and clarify that you oppose the devastating effects of this bill. The bill requires everything be called to 911, no matter how minor an incident or accident. This would burden an already overloaded emergency response system and jeopardize the health and safety of all citizens who count on first responders for real emergencies. If 911, the local district attorney, and the Justice Center are not called for every incident, staff would face a felony with a possible four year jail sentence. Our ability to attract staff, which is already dire, will be made worse. Sirens will be blaring on a regular basis around our residences and day programs, stigmatizing us and alarming communities. Amendments have been attempted but the bill’s approach is such that it is extremely difficult to carve out all non-emergency events. Our staff are already required by regulation to engage law enforcement whenever a response by law enforcement is needed. Our staff are already trained to call 911 when there is an emergency and a first responder is needed. This bill does nothing to protect people and, in fact, puts all of us at risk by reducing the effectiveness of our 911 emergency response system. When appropriate, the District Attorney’s office should be engaged by law enforcement, not by citizens, and especially not for non-criminal events. A report recently released by Autism Speaks about treating the health conditions that frequently accompany autism has particular relevance to the work being done at the Centers of Excellence here in New York State. The Centers of Excellence are dedicated to excellence in Autism services through prompt evaluation and diagnosis, individualized education and services, social and life skills enhancement, innovative practices, training and research. Data on what happens to students who transition from school, the costs in the United States for support, and the fact that “only 1% of autism research funding went to studying life span issues such as supports to improve success in employment and community integration” – are but some of the more interesting information contained in the report. The Centers of Excellence is a collaborative effort between The Center for Discovery, Upstate Cerebral Palsy, and the Developmental Disabilities Institute. We look forward to the opportunity for continuing the many valuable initiatives under the Centers of Excellence with the support and collaboration of our partners at OPWDD, SED, and DOH. View the entire Autism Speaks report here. Learn more about the Centers of Excellence at https://www.facebook.com/CentersofExcellence/. 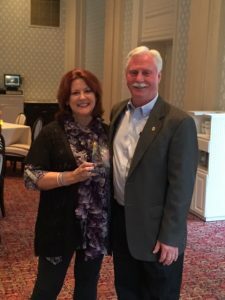 On April 21, at the annual Spring Home Service meeting in Cooperstown, the initial Lou Withiam Award was presented to Cheryl Garlock from CP Rochester. The award has been established to honor a Home Service Director who has exhibited exceptional dedication and commitment to supporting people with disabilities and their families. Mr. Withiam raised millions of dollars to support the Home Service Program during his two, 3-year terms as Chairman of the Elks Major Projects Committee. He was a great friend to our organization and it was felt that this was a fitting way to recognize his commitment and to honor a Home Service Director each spring. Ms. Garlock has been with CP Rochester for more than 30 years as a Home Service Director and Manager of Service Coordination. She is currently serving as Start-up Broker and Support Broker for the agency’s Self Determination program where she assists individuals enrolling in the OPWDD Self Determination Program through development of a self-directed plan and budget. Ms. Garlock facilitates a monthly group for persons who have survived a stroke and their family members, and Ray’s Social Club, a group for people ages 14 – 25 who are transitioning into the adult world. She is also a certified trainer for the NYS Office for People With Developmental Disabilities and has volunteered for many organizations in Monroe County. A member of the Elks, she was the first woman President of the Webster-Fairport Elks Lodge in 2011-2012 and served as Secretary for Webster-Fairport Elks Lodge from 2012-2016. The COPA Human Resources Professionals Conference for the Disability Provider Community is scheduled for June 20 in Saratoga Springs. The registration deadline for the event is June 9. Don’t miss the program that will be of interest to Human Resources staff, Executive Directors, QA and Corporate Compliance administrators, and other management staff. Visit our website http://www.copanys.org to register. Nominations must be received by Friday, July 14. More information and nomination forms can be found on the Justice Center Website here. Al Sigl Community of Agencies, AutismUp, and CP of NYS Affiliate CP Rochester are collaborating to build the new Golisano Autism Center Rochester, which will expand and enhance services to support people with autism in the Greater Rochester and surrounding areas. Philanthropist Tom Golisano is providing a $2.5 million challenge grant and his Golisano Foundation has pledged the first $500,000 to launch the capital campaign. For more information visit the CP Rochester website here. The Developmental Disabilities Planning Council (DDPC) has announced funding for the two grant programs below. Additional information regarding this and other grant opportunities can be found on our website here. The DDPC will select one grantee in the amount of $175,000 to develop multimedia electronic resources for individuals, their family members, and caregivers, to utilize available tools, provide peer-to-peer education, and share their experiences so that others can learn from these situations and better protect themselves. The site and application will also provide a reporting mechanism so that witnesses and bystanders can report scenarios as they occur. Several preventative training resources exist, but these methods do not provide constantly accessible and real-time tips or peer educational resources. Therefore, a web-based peer-support platform, that is a central resource and location where individuals can provide peer assistance, is needed so that information is constantly accessible. The DDPC will also select one grantee in the amount of $75,000 to carry out an 18-month research grant, focused on the systematic information gathering including a review of existing literature and programming, as well as qualitative research, with the intended outcome of a strategic plan and recommendations for the DDPC to more adequately work in the area of exploitation and abuse prevention. For more information please see the DDPC website here or contact Kimberly Berg at 518-486-7505 or Kimberly.berg@ddpc.ny.gov.